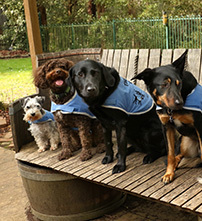 In conjunction with the team at Alpha Canine Professional, Lead the Way offers an intensive six-day course for individuals wishing to train their dogs as Therapy-Dogs for work in Animal-Assisted Interventions (AAI). 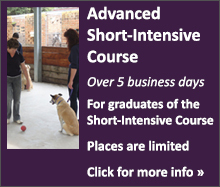 This intensive course, is designed to provide a solid foundation to begin your work in professional therapeutic settings (such as Animal-Assisted Therapy - AAT) or visiting, volunteer or recreational settings (such as Animal-Assisted Activities - AAA). 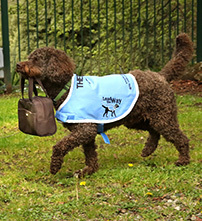 The course provides a comprehensive background to Therapy-Dog training with the Canine Leadership System, handling, socialisation, psychology, body language, and Canine Good Behaviour Shaping. It also provides information to help get you started in Animal-Assisted Interventions, including how Human-Animal Interactions (HAI) are beneficial, how to manage ethical and legal issues, and understanding Occupational Health and Safety. At the end of this course, you will have the skills to begin your work together in visiting or professional therapy settings. 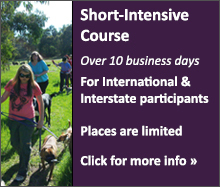 * Note: This course replaces the Intensive Therapy Dog Handlers Course - 5 days from 2016. Pre-requisite: You must have completed our Foundation AAI and Therapy-Dog certification course before enrolling in our Advanced Therapy-Dog Applications Course. The Advanced course is designed for graduate teams (handler & dog) who wish to extend their theoretical knowledge and practical application skills. It provides a deeper understanding of the mechanisms of the Human-Animal Bond (HAB), and provides a framework in which to understand the how and why of Human-Animal Interaction (HAI). Practical classes include developing an understanding of 'off-lead' reliability, the fundamentals of trick training, and the basics of agility training. At the end of this three-day intensive course, teams will have a greater understanding of how to work together in therapy settings, and have a tool-kit of tricks and ideas to try. Pre-requisite: You must have completed the Foundation AAI and Therapy-Dog certification course before enrolling in our Therapy-Dog Refresh & Re-certification Day. The Re-certification Day allows graduates to refresh and recap on their skills after graduation. It also allows teams to Re-Certify once their original Certification has expired (usually after 2 years). 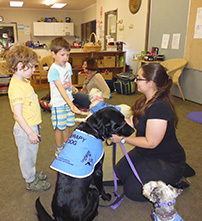 This intensive and activity packed day runs participants through all of the Leadership Obedience, Canine Good Behaviour Shaping, and Therapy-Dog application skills taught in the Foundation course. The assessment criteria used are the same as that in the Foundation course. 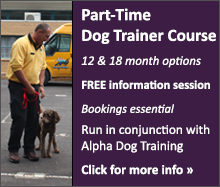 This course is also open to previous (human) graduates who want to certify a second or subsequent dog, and don't feel they need to attend the Foundation course again.